I am Sebastian, PhD student in Applied and Computational Mathematics in the Department of Mathematics at Simon Fraser University. I work under the supervision of Professor Nilima Nigam (from the Department of Mathematics) and James Wakeling (from the Department of Biomedical Physiology and Kinesiology). I am interested in Applied Mathematics, Numerical Analysis, Functional Analysis, Eigenvalue problems and the Finite Element Methods. I live in Metro Vancouver, Canada, with my wife and little daughter since September, 2015. We lived in Concepcion, Chile, until August 2015. 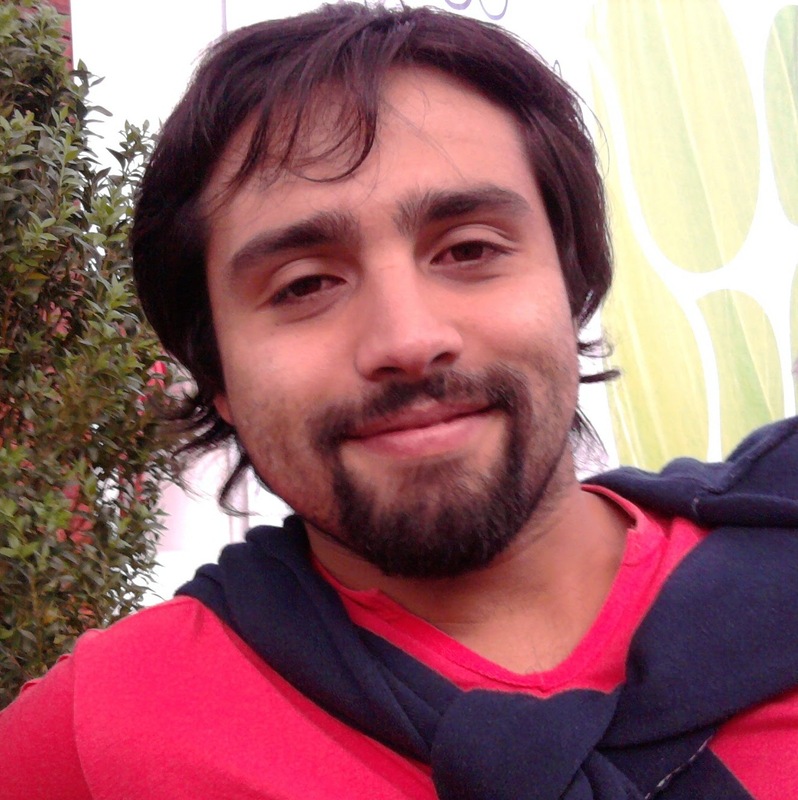 I got my Bachelor in Mathematical Engineering in 2012 at Universidad de Concepcion, Chile. Then, I completed my Masters in Mathematical Engineering in 2015 at Universidad de Concepcion. I started my PhD in September, 2015 at Simon Fraser University, Canada. I expect to be graduated in 2019. Check my Google scholar for published manuscripts. S. Dominguez, N. Nigam, and H. Sutton. First Korn’s inequality and the Jones eigenvalue problem on Lipschitz domains. S. Dominguez, and N. Nigam. Semi-implicit scheme for a 3D model of skeletal muscles. Jones modes in Lipschitz domains. Spectral Geometry: Theory, Numerical Analysis and Applications Workshop at BIRS, Banff, Canada. A numerical investigation of Jones eigenmodes. ECCM-ECFD 2018, Glasgow, Scotland. An overdetermined eigenvalue problem in linear elasticity. CAIMS 2018, Toronto, Canada. Jones eigenpairs and a Korn's-type inequality. Applied & Computational Mathematics Seminar, Portland State University, USA. An eigenvalue problem in linear elasticity. CASCADE RAIN 2018, Portland State University, USA. 3D muscle modelling. PIMS CSC seminar, Simon Fraser University, Canada. Dynamic Nonlinear Elasticity to Model Skeletal Muscle in 3D. SICB 2018, San Francisco, USA. Finite element methods for skeletal muscle modelling. 1st Biennial Meeting of SIAM PNW Section, Oregon State University, USA. A mixed FEM for the muscle-tendon-aponeurosis complex. 14th USNCCM 2017, Montreal, Canada. A finite element approach for the approximation of Jones modes. first CAIMSC 2017, University of Calgary, Calgary, Canada. A combined Bayesian optimization-finite element approach for isoperimetric inequalities. WAVES 2017, University of Minnesota, Minneapolis, USA. Jones Modes. CASCADE RAIN 2017, Simon Fraser University, Vancouver, Canada. Shape optimization in Spectral Geometry: A Bayesian approach. SIAM CSE 2017, Atlanta, USA. A Finite Element approximation for skeletal muscle tissues. CAIMS 2016, University of Alberta, Edmonton, Canada. On the global optimality of the regular pentagon for the Dirichlet eigenvalue problem. CASCADE RAIN 2016, Washington State University, "the other" Vancouver, USA. On the global optimality of the regular pentagon for the Dirichlet eigenvalue problem. WONAPDE 2016, Universidad de Concepcion, Concepcion, Chile. A primal-mixed formulation for the strong coupling of quasi-Newtonian fluids with porous media. Jornadas Matematicas de la Zona Sur 2015, Chillan, Chile. Spectral Geometry: Theory, Numerical Analysis and Applications. BIRS, Banff, Canada. Steklov eigenproblems. AIM, San Jose, USA. Optical Imaging and Inverse Problems workshop 2016. IMA, University of Minnesota, Minneapolis, USA. S. Dominguez, N. Nigam, and H. Sutton Numerical approximation of Jones modes. SFU Symposium on Mathematics and Computation 2017, Simon Fraser University, Burnaby, Canada. S. Domínguez, R. Kong, N. Nigam, H. Rahemi, D. Ryan and J. Wakeling. Functional implications of helical fibre trajectories in skeletal muscle. NWBS 2016, University of British Columbia, Vancouver, Canada. S. Dominguez, G. N. Gatica, A. Marquez and S. Meddahi. A primal-mixed formulation for the strong coupling of quasi-Newtonian fluids with porous media, CI2MA poster session 2015, Universidad de Concepción, Universidad del Bío Bío and UCSC, Chile. I visited the Department of Mathematics at Simon Fraser University in February 2014. I worked in IRMACS under the supervision of professor Nilima Nigam and professor Steven Ruuth until April 2014. About a year after, I visited the Neuromuscular Mechanics Laboratory at Simon Fraser University from May to July 2015 where I worked under the supervision of professor Nilima Nigam and profesor James Wakeling. They are currently my senior supervisor and co-supervisor, respectively. Please, contact me if we have any questions about my work. © Sebastian Dominguez 2016. All rights reserved.